Soon after the Mamluk dynasty in Egypt was conquered by the Ottomans in 1517, the same Cairene workshops that created the Mamluk rugs started to produce rugs with Ottoman designs (see exhib no. E3). This is the first of a number of west Anatolian rugs presented here that show Ottoman influence in their design. In order fully to appreciate its patterns, it is important to compare it to a 16th century rug made in Cairo (exhib no. E2). 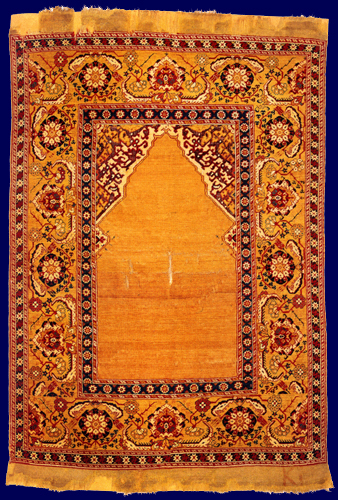 The corner spandrels seen here, which should be interpreted as quarter-sections of medallions, the remainder of which lie unseen beneath and beyond the borders, have clear similarities with the spandrels at the lower end of the Cairene rug. The minor border of the Cairene rug also reveals the origins of the minor borders on the Sibiu rug. The floral main border of the latter is derived from that on a Cairene rug similar to another exhibited here (exhib no. E3), or shares a common heritage. 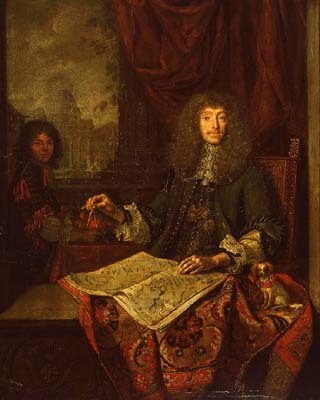 This beautiful border pattern and the long plain-weave ends can also be seen on a rug depicted in Jacob Toorenvliet's Portrait of Carel Quina, 1669, in the Rijksmuseum, Amsterdam. The rug in the painting has very naturalistic floral minor borders, which are rarely seen in surviving rugs.